The inner wall of the GRP pipe is very smooth, and the Hazen-Wllliams roughness coefficient of the new GRP pipe has a C value of 160-165. Its conservative design value (in terms of 50 years) is 150. The new steel tubes had a C value of 120 and C=65 after use. The decrease in the C value is due to oxidation of the iron molecules on the inner surface of the tube and electrochemical corrosion reflecting the scaling of the inner wall. Comparison of the flow of steel pipe and GRP pipe . Because the absolute roughness of the new steel pipe is 0.05mm, the absolute roughness of the corroded steel pipe is 3mm, and the corrosion is 60 times the absolute roughness of the uncorroded steel pipe. Taking the Hazen-Williams average roughness coefficient C of the steel pipe to be 100 and the GRP pipe C to 150, the 12-inch GRP pipe has the same flow rate as the 14-inch steel pipe. Or, GRP pipe 's flow is 36% larger than steel pipe in the same pipe diameter. Since the Hazen-Williams roughness coefficient C value of the steel pipe decreases significantly with the year, its energy consumption will also increase significantly. The energy consumption of the steel pipe line is much larger than that of the GRP pipe line. There are two main reasons for this: First, due to oxidation of steel pipes, electrochemical corrosion and other factors, scaling of the inner wall increases resistance and increases energy consumption. Second, GRP pipe is much smoother than steel pipe in the new pipe state. . It is worth pointing out that in the last few years of the pipeline life, the required pumping power for the steel pipe line will increase from 25 to 60 hp; while the power of the GRP pipe line will remain basically unchanged. Set the daily flow rate to be 60,000 square meters, the total length of the pipeline is 10 kilometers, tap water is delivered, the dynamic viscosity coefficient is 1.2*10-6, the slope height is zero, and the absolute roughness of the steel pipe is averaged at 1.65mm. Then: GRP pipe 's head is 30.85m, while the steel's head is 58.62m. The energy consumption of steel is 1.9 times that of GRP pipe . This means that later-stage costs will be greatly increased when the pipeline is in operation. GRP pipe 's liner is made of food-grade resin to ensure that the water quality meets the national standards (JC586-1995) and can be used to transport and store chlorine-containing drinking water and domestic water. In addition to this, the inner wall of the GRP pipe under no light conditions does not breed microorganisms, so the buried GRP pipe can further ensure the quality of tap water. As the steel pipe must be coated, the GB13295-91 standard imposes strict regulations on the paint: the paint should be insoluble in water and must not cause water to produce odors and tastes. The harmful substances in the paint should meet the relevant regulations of the Ministry of Health for water diversion. In addition, due to the rough wall of the steel pipe, it is difficult to achieve the smoothness of the inner wall of the GRP pipe even if it is coated with an anti-corrosion material, and corrosion will occur after long-term use, and thus microorganisms and scaling will be generated, thereby affecting the water quality. GRP pipe adopts double ring rubber seal apron socket connection, 100% pressure test at the connection place during installation, which can ensure that the joint sealing performance is 100% qualified. In addition, since FRP is a composite material with high compactness, the pipe body will not only seep from the inside to the outside (such as sewage that affects the farmland through extravasation), but also cannot seep from the outside (such as the sewage from the outside Leakage will affect the water quality inside the pipe). The working conditions required for the welding of steel pipes are relatively high. During the construction process on site, the welding quality is often difficult to guarantee. Therefore, the reliability of the sealing at the welding site is lower than that of the GRP pipe . The squib phenomenon occurs at the welding point of the steel pipe. Due to the high strength and good ductility of the FRP sand trap, it will not be damaged by water hammer action and instantaneous overpressure. This shows that GRP pipe 's impermeability is much better than steel pipe. Under the possible combination, the glass fiber reinforced plastic pipe can be designed flexibly according to the conditions of use, and the domestic advanced production equipment can fully produce qualified products according to various design schemes. Due to the stable quality of raw materials such as food grade resins, it has been used well for many years. GRP pipe consists of a structurally stable inorganic non-metallic material and a macromolecular chain of organic materials. The structure of the resin-rich layer inside and outside the roadway makes the performance of the pipe stable in long-term use, and the seepage and seepage are very few. It will not affect the water quality and environmental water and soil conveyed. 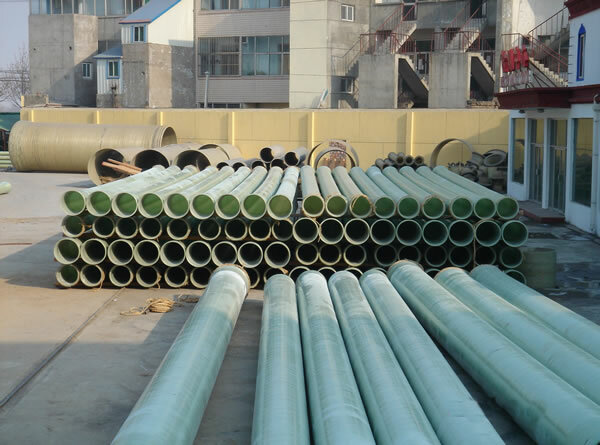 Therefore, the glass fiber reinforced plastic pipe is a very good environmental protection material. . Due to its high strength and good ductility, FRP sand traps will not be damaged by the action of water hammer and instantaneous overpressure, and will not affect the water quality and the environmental water and soil conveyed. Therefore, FRP is evaluated in many aspects. Sand traps are a safe pipe. In addition, due to the smooth inner wall of the glass fiber reinforced sand tube, the resistance of the water flow is small, especially in the case of gravity flow, the required pressure equipment is less, and the operating power is saved. Under normal circumstances, the operating cost of FRP sand pipe is about 20% lower than other pipes. Due to the high strength and stability of the glass fiber reinforced plastic sand tube, non-external force is not easy to damage, and it can be said that the glass fiber reinforced plastic sand tube is basically maintenance-free. The good performance of running pipelines at home and abroad also proves this point.